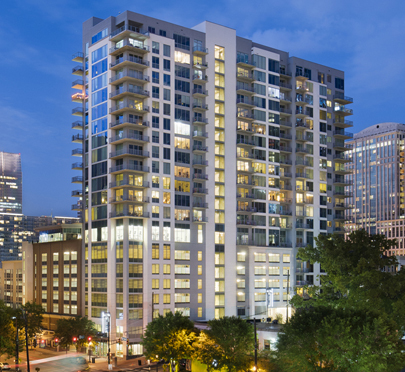 Nine15 Midtown is a mixed-use development in Midtown Atlanta. The site is bounded by Peachtree Place on the North, Cypress Street on the East, 8th Street on the South, and West Peachtree Street on the West. Approximately 19,000 SF of retail will be located at street level. Approximately 1,032 parking spaces for residents, retail customers and employees of the neighboring AGL Building are provided in a seven level of the parking structure. There are 176, 5-story residential units on the eastern half of the site. A 21-story residential tower on the southwest corner of the site has 193 apartment units which brings the total gross residential area to approximately 419,000 GSF. A landscaped amenity deck on the eighth ﬂoor includes a pool, grilling stations, ﬁtness center, clubroom and sports club. 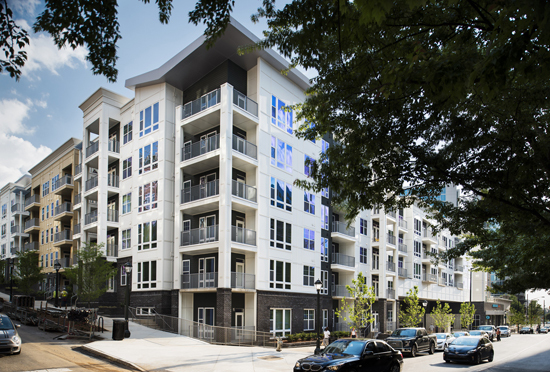 RJTR provided architectural and interior design services for Alta Midtown developed by Wood Partners. Photography courtesy of O Studios.